The article refers to conception of carnivalisation of literature as initiated by Mikhail Bakhtin, but is composed of a completely different mode and formulates conclusions with respect the newest scientific stances. Particular comedies are looked at form the perspective of multitext, which leads to formulation of a final conclusion that in the minstrel society there was no work but play recognized as a form of everyday conduct. The play was made the source of incomes, and thus allowed them to maintain the minimum level required for existence. If they started some work, they aimed at cheating and making fun of gullible burghers to earn at their cost and “joyfully romp” while staging another play at an improvised stage. Mickiewicz’s satirical and humorous inclinations were observed from his childhood, and the poet could develop them superbly among the Philomates. The poet’s juvenilia failed to meet a favorable reception by the literary historians. The richness of Philomates Archive disclosed at the beginning of 20th century, and primarily translation of Voltaire, questioned many theses present in the poet’s 19th century monographs and biographies. 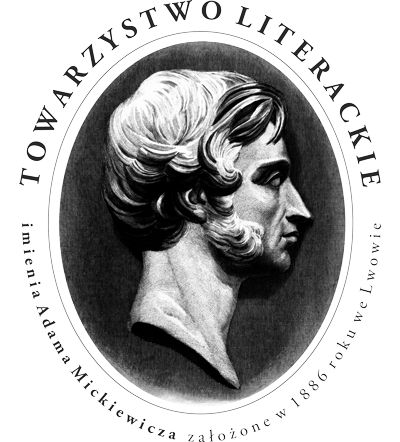 The researchers were astonished and disappointed at the triviality of Mickiewicz’s first literary pieces. “Serious” productions rather than “iambs” and texts “à la Voltaire” whose young author was to reveal the makings of the inspired poet were expected; thus the role of laughter in those poetic exercises was often disregarded and shamefully passed over with silence. Inappropriateness of Mickiewicz’s unseriousness in the eyes of many critics is also supported by long-lasting struggles with the interpretation of Winter in the City. What Does “Barrel Organ” by Bolesław Prus Play? The article is an analysis of Bolesław Prus’s classical short story Barrel Organ (Katarynka) and contains two trains of thoughts. The first one reconstructs the historical-cultural context connected with the title playing mechanism, exhibits its role in building the modern awareness of artists and critics for the connection of technology and art, treatment of art as a merchandise, and for the relationship between high and popular art. Such problems prove vital for the literary positivism, in which a high artistic level mingled with social use of literature, while the problem concerning a man’s necessity of art (in its aesthetic and not only cognitive dimension) was left aside. The second thought touches the novel’s structure, and reveals its symmetric patterns with a marked ideological provenance. Sharpness of meaning oppositions is here permanently violated, and final conclusions prove that this plain humorous tale in question exhibits Prus’s conviction that capitalism and democracy made literature a part of the market, devoiding it of the obvious social functions, especially cognitive and didactic – all inseparable from positivistic realism poetics. The theme of the article are expressionist images, and time and history conceptualizations found in the poems produced in the Poznań group of “Spring” [“Zdrój”] by Stanisław Kubicki, Emil Zegadłowicz, Adam Bederski, Witold Hulewicz, and in the articles published in this periodical. 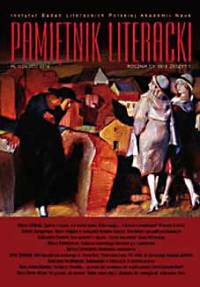 The topics in question allows to point at the most vital disparities between Polish and German expressionism made explainable by the diffrent political situation of the countries by the end and after World War I. Romantic-like understanding of historical process – particularly vital and suggestive part of romantic world-view to which “Spring” members referred became, as a matter of fact, a background for expressionist ideas, evolving from pre-modernistic conceptions to modern ones, akin to that of Arthur Schopenhauer and Friedrich Nietzsche. The paper discusses the problems of Karol Irzykowski’s short-story writing. Selected novels by the writer are here analyzed with reference to the idea of “mannerism poetics” being, according to the author, a useful term to describe some literary texts composed at the beginning of 20th century (to date referred to as “experimental” or “avant-garde”). The author takes on the “trans-historical” perspective to confront Irzykowski’s literary creativity with the end 16th and 17th c. literary theory concepts. The subject of the paper is Seweryna Szmaglewska’s book Smoke over Birkenau, one of the most significant (as a fact-collecting, intellectual, and artistic) achievement in the domain of Nazi concentration camp literature. The author analyses the book’s origin and reception, the documentary value and functions (attesting, accusing, cognitive, etc.) connected with it, and first and foremost its literary and world view dimension. The text shows Szmaglewska’s struggle with the form to compose a text expressing the concentration camp reality in possibly most objective way, and the achieved ideological and artistic effects. This paper deals with the Polish construction “iść w sołdaty [be drafted; lit. become a sołdat (solider)]”, which is grammatically atypical: it is not clear what the value of its noun constituent’s case is. The point of departure for the analysis is Igor Mel’čuk’s paper about the parallel Russian construction. (The Polish construction was borrowed from Russian during the Russian rule on Polish territory.) The solution is similar to that for Russian: “sołdaty” in this expression is an atypical (non-virile or depreciative) accusative form. Additionally, some similar expressions consisting of a preposition and a noun form analogous to “sołdaty” are discussed. It is possible to see in them a trace of a new case in Polish (post-prepositional Accusative). Dances were a permanent element of 16th century court life. Adapting the Italian treaty Il libro del cortegiano by Baldassare Castiglione to Polish reality, Łukasz Górnicki omitted many of the elements he found improper for a Polish courtier, but he preserved the dance fragments. Diversity of written, iconographic and musical sources often fail to facilitate a researcher trying to understand the role of dance in the past epochs and to reconstruct old choreographies. Regardless of it, dance, though seen for long years from the perspective of ballet history, deserves also an insightful analysis from the point of view of cultural anthropology. Some of the typical problems to appear while combining different research perspective are the interactions between the court and plebeian plays, the dance’s therapeutic function, its particular place in the Neoplatonic world view, and last but not least the special interest shown to women. The paper reconstructs the photography aesthetic conceptions found in the texts by two writers, namely Bolesław Prus and Ryszard Kapuściński. The former sets the problem of the picture within the scope of basic values, i.e. Usefulness, Perfection, and Happiness. In the first aspect, a picture – due to its faithfulness and credibility – is fully appreciated. In the second aspect, connected with the problem of aesthetic value, Prus expresses the opinion that a picture is not a match to a painting but due to technical development these two could be made equal in the future. In the last aspect, the writer consistently maintains that a picture can neither substitute contact with a person nor remove the experience of elapsing time. In the latter writer’s reflection, the issue in question is refreshed and the picture gains a metaphorical status. As a result, there appears not only development of cognition but also confirmation and purification of reality. 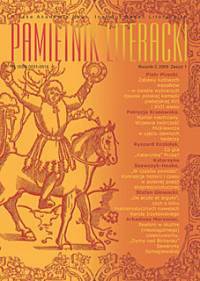 The text is an extensive analysis of Marek Hermann’s book devoted to the descriptions of the firmament in latin astronomic poetry, formulated very often in metaphorical terms. The author analyses the lightening of stars and planets, their movement and localization, the mythological genealogy of particular constellations. The analysis involves the theoretical problem of the boundaries of metaphor because the figurative interpretation of these poetical images is not always sure, taking into account the connection of such images with the ancient religious believes. Consequently, some of them may be interpreted as the literal expressions of a sacral reality. The text discusses the book on the categories of “common places” and “individual places” in the literary creativity by Leśmian, Schulz, and Kantor, and attempts to situate the authors in question against a wider meta-artistic background. The present text is a review of Jacek Łukasiewicz’s book in which the reviewer, in the first part, accounts for the considerations about socialist realism in Poland, while in the second part he discusses the literary creativity by Miron Białoszewski, Stanisław Grochowiak, and Zbigniew Herbert. 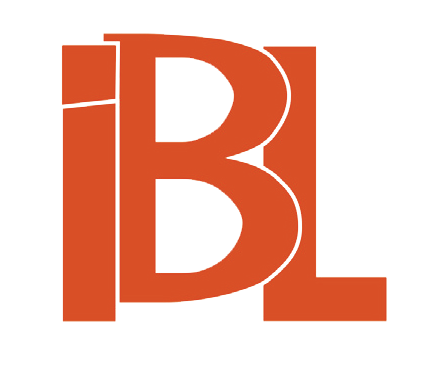 The text is a review of Elżbieta Winiecka’s book in which the figure of syllepsis and the concept of literariness built around it are made the key to a description of Miron Białoszewski’s literary creativity. Literary theory and literary history optics mingle and complement one another in the paper. The text analyses Danuta Opacka-Walasek’s book on the issue of time and the modes of its presentations in contemporary lyric poetry. Special attention is here paid to the categories of moment and eternity in the poetry by Czesław Miłosz, Wisława Szymborska, Zbigniew Herbert, and Adam Zagajewski approached from different philosophical perspectives. The review discusses Maciej Dajnowski’s book on this branch of Stanisław Lem’s literary creativity which is referred to as grotesque, and which includes e.g. The Cyberiad, The Star Diaries, and Robot Fairy-tales. Dajnowski analyses the ways the grotesque manifest itself in Lem’s texts and the functions it performs, emphasising its cognitive function. The review is a presentation of a series of articles collected in a volume which is issued as proceedings of a conference on Wisława Szymborska organized in Stockholm. Since contributors to the volume in question are Polish literary researchers and foreign Slavicists, the articles reveal different approaches to the subject matter and are of dissimilar scopes, from deep studies to investigations and general analyses, and from to scientific explorations to papers of a popularizing character. The text in question is a gloss to the book by Elżbieta Janicka on a Polish writer Andrzej Trzebiński. This is a text in remembrance of Peer Hultberg, died in December 2007, an outstanding Danish Polish scholar, a distinguished expert in Polish literature, especially the turn of 19th and 20th c., and also a writer – the author of avant-garde novels. The text is Professor Jerzy Poradecki’s obituary – full professor of the Faculty of Philology, University of Lodz, the head of the Chair of Polish 20th and 21st c. Literature, an expert in contemporary literature, critic and editor, for many years an active participant of Lodz artistic life.